The nightmare contingency for NASA pilots. Just about every aspect of spaceflight harbors dangers that are both obvious and concealed. Yet, it is launch and landing that create the most white knuckles and bated breaths. These concerns are well-founded. Getting into orbit requires harnessing unfathomable quantities of volatile energy with laser beam precision. Coming home necessitates somehow dissipating a similar volume of energy within comparably narrow margins of error. As risky as those two endeavors may seem, one NASA plan for the Space Shuttle combined launch and landing into a single 25-minute ride with presumed risks that far exceeded the sum of its parts: the Return To Launch Site (RTLS) abort. 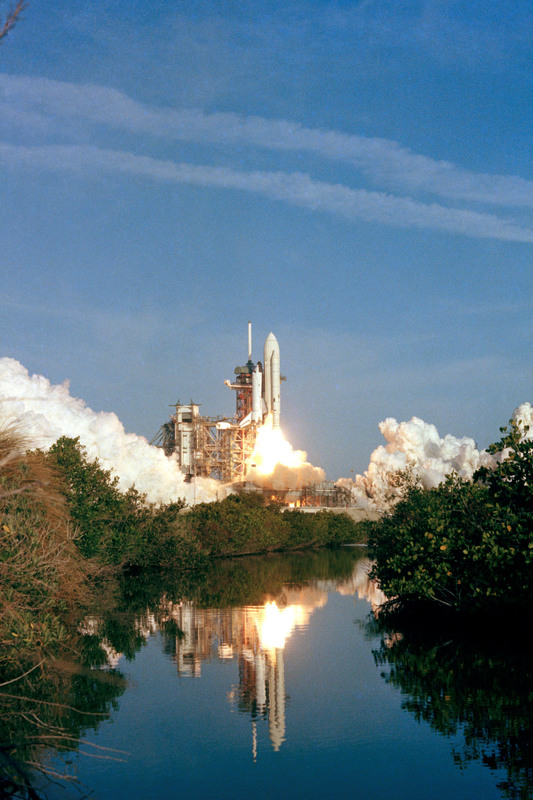 The first space shuttle mission was briefly considered as an intentional RTLS test flight. Fortunately, cooler heads prevailed. The good news is that the shuttle’s retirement has made the RTLS argument merely an academic one. Of the 135 Space Shuttle launches, only one (STS-51F on 7/29/85) experienced an abort-inducing failure during ascent. In the case of 51F, they safely made a lower-than-planned orbit and carried out the mission. All of the other flights cleanly avoided the dubious honor of settling the RTLS bet. Before we dissect the RTLS scenario, an overview of the nominal launch sequence and the entire abort menu is prudent. At “T minus 6 seconds”, the three Space Shuttle Main Engines (SSME) began burning liquid oxygen and liquid hydrogen from the huge External Tank (ET) attached to the orbiter’s belly. When the countdown reached 0, the SSMEs would be at full power and the two Solid Rocket Boosters (SRB) straddling the ET would ignite to initiate liftoff. About two minutes into the flight, the SRBs would burn out and then be jettisoned. The SSMEs would continue to burn fuel from the ET until about eight and a half minutes after liftoff. For missions with a particularly heavy payload, the two Orbital Maneuvering System (OMS) engines could be fired during ascent to help the shuttle aloft. The OMS engines were also used later to adjust the shuttle’s orbit, including the deorbit burn that brought it home at the end of the mission. After Main Engine Cutoff (MECO), the shuttle would jettison the empty ET, which would disintegrate as it tumbled back to Earth. That’s all there was to it. What could possibly go wrong? Once the shuttle departed the launch pad, an abort could be triggered either by a problem with one (or more) of the SSMEs, an Auxiliary Power Unit (APU) failure, a pressure leak in the crew cabin, or a fuel leak in the ET, among a list of other undesirable gremlins. The shuttle’s location and energy state at the time of the failure, as well as the severity of the problem, would dictate the type of abort that was declared. Other than RTLS, mission control had three primary abort options at their disposal: Transoceanic Abort Landing (TAL), Abort Once Around (AOA), and Abort to Orbit (ATO). Along with RTLS, these were considered intact aborts; meaning that the crew had a planned and practiced path to safely land the orbiter and its cargo (including themselves) somewhere in the world. If conditions did not permit any of the intact aborts, or if additional failures occurred, the next option would have been a contingency abort. Basically, the crew would have parachuted or ditched in the ocean…neither of those being cozy options. One exception among contingency abort options was the East Coast Abort Landing (ECAL). In this case, the crew had a handful of runway-equipped landing sites along the North American east coast (or Bermuda) to set the bird down. The problem was that these locations were less than ideal to handle the needs of a distressed Space Shuttle with only one shot at landing. I suppose that any runway looks inviting when your alternative is a long swim in the Atlantic. Other than RTLS, mission control had three primary abort options at their disposal: Transoceanic Abort Landing (TAL), Abort Once Around (AOA), and Abort to Orbit (ATO). A TAL abort could be declared sometime after about two and a half minutes into the launch. At this point, the shuttle would have sufficient fuel to cross the Atlantic Ocean and glide into one of the preselected landing sites in Europe or Africa. If you were ever confused by weather-related launch delays when KSC had clear skies, bad weather at potential TAL landing sites could have been the culprit. Later in the launch, there was a very narrow window (just a few seconds) to declare an AOA abort. In this scenario, the shuttle would come in for a landing after a single orbit of the earth. This option would be chosen if the shuttle didn’t have sufficient energy to attain a stable orbit, or an issue with a life support system necessitated a quick return. It was generally considered a very low probability that AOA would ever be utilized. ATO was chosen if a failure occurred late in the ascent and the shuttle had attained enough velocity to reach any stable orbit…not necessarily the planned orbit. This was the case with mission STS-51F that I mentioned earlier (a launch worthy of its own article). If fate allowed you to choose your abort, ATO would be the clear winner. It was technically an abort, but it still allowed you to spend some time in space…bonus! An RTLS abort could be declared if a failure happened during the first four minutes of the launch (notice there is some overlap with TAL). Relatively speaking, the shuttle was still quite close to KSC during this period. In order to land, the shuttle had to convert from a fire-belching rocket ship into an oversized glider. Unfortunately, limits within each of the main propulsion systems prevented this transition from happening until the shuttle was much higher, faster, and further down range. The Shuttle's Solid Rocket Boosters break away and fall to Earth about two minutes after liftoff. The Solid Rocket Boosters were like giant roman candles. Once ignited, they could not be throttled or shut down. No matter what happened while the SRBs were burning, you simply had to wait until they fizzled out before taking any corrective action. To have jettisoned the SRBs while they were still burning would have created questionable structural loads on the ET…not to mention adding two unguided surface-to-air missiles to the astronauts’ worry list. Once the SRBs were gone, it was theoretically possible to shut down the SSMEs (although they could not be restarted) and jettison the ET. The tank, however, was still quite full of fuel at this point. The primary concern was that firing the explosive bolts to jettison a heavy ET would cause the fuel to slosh and possibly steer the tank back into a collision course with the orbiter. The consequences of that scenario are obvious. The unintuitive, yet safer option was to continue burning fuel while heading away from the place you planned to end up. In order to shift the orbiter’s center of gravity forward and make it a stable glider, most of the fuel in the tail-mounted OMS tanks had to be depleted. This would normally happen though the course of a standard mission. In an abort mode, this fuel had to be burned off through the OMS engines while the SSMEs were also draining the ET. Once again, physics would have forced a damaged shuttle to continue accelerating and climbing away from its safe haven, the KSC runway. The TAL, AOA, and ATO abort scenarios were made up of entirely of elements from a nominal shuttle flight. You have an eastbound, powered ascent, and then an eastbound descent and glide to the landing site. Sure the abort could make the landing location different than what you planned, but that’s why astronauts packed sneakers and sandals in their carry-on baggage! These aborts just changed the timing of those inevitable events and maybe would have added a few grey hairs. Even so, it was easy to entertain the notion that the astronauts would still get to go home at the end of the day. The shuttle would have swapped ends while still heading spaceward at about Mach 5 and never easing off of the throttle. The RTLS isn’t quite so easy to rationalize. While this abort shares the eastbound powered ascent, most of the descent phase would have been westbound. 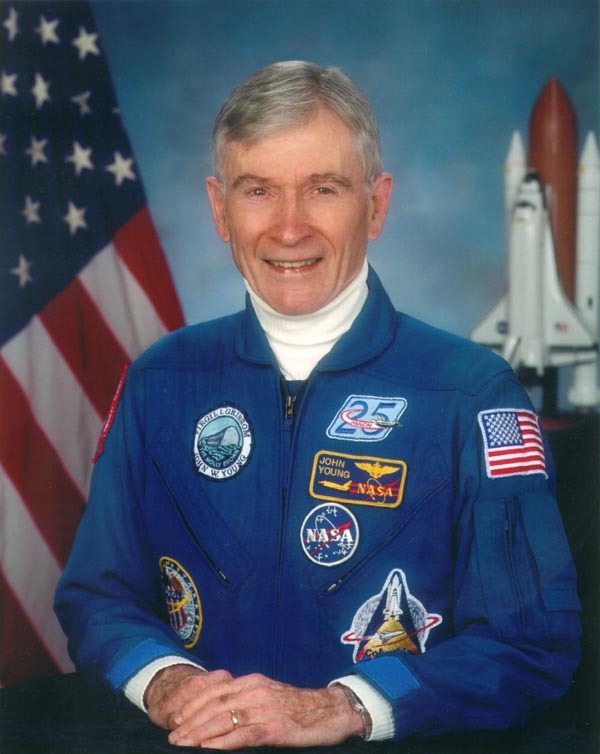 Tying those two events together was an element that was unique to RTLS and a boon to Rolaids sales among the astronaut corps: the Powered Pitch Around (PPA). In a move that only Burt Reynolds could love, the shuttle would have swapped ends while still heading spaceward (at about Mach 5) and never easing off of the throttle. With the SSMEs now facing forward, their retrograde thrust would slow the orbiter’s eastward progress. Eventually, the shuttle would stop in midair (albeit very thin, high-altitude air) and begin heading westward back to the runway at KSC. The PPA would have begun at an altitude somewhere around 400,000 feet, where there is insufficient air to cause much concern about the aerodynamic effects of tumbling the shuttle. The topic of debate was whether a handicapped propulsion system would have sufficient control authority to whip the orbiter/ET combination around at the 10-degrees per second rate required for the PPA. Many experts agree that a healthy orbiter could pull it off…but healthy orbiters don’t do RTLS. There were two camps regarding the pitfalls of the shuttle doing Mach 5 in reverse with the SSMEs blazing. Some thought that this was like spitting into the wind, and the shuttle would be negatively affected as it flew through the plume of its own exhaust gasses. Others believed that the RTLS retrograde burn was no different than the deorbit retrograde OMS burn that began the entry phase of every shuttle flight. A further concern with the PPA was the rate at which the shuttle/ET would descend. As the shuttle’s eastward progress began to slow after the PPA, it would begin losing altitude at an ever increasing rate. At the point where its eastward velocity was zero and it began to accelerate westward, it would have been falling vertically at greater than Mach 1! Mind = blown. Such a fast descent rate would have subjected the orbiter and ET to significant and ever-increasing dynamic pressure and heat loading. The descent rate would have been gradually arrested as the shuttle picked up westbound velocity (about 200,000 feet of altitude is lost during the PPA), but the air would get thicker and cause more friction with each foot of altitude lost. Whether the vehicle could have survived this torture is yet another RTLS-related point of discussion around NASA water coolers. For the sake of argument, let’s say that all aspects of the PPA went perfectly and the shuttle was zooming back towards KSC (called the “flyback phase”). Rather than breathing easy, the crew would have to negotiate what many consider to be the most difficult and risky portion of an RTLS: the Powered Pitch Down (PPD). With the SSMEs still burning, but the ET nearly empty, the shuttle would be placed in a slight nose-down attitude. This attitude would be held through MECO and the firing of the explosive bolts that jettison the ET (good riddance!). A few bursts of the shuttle’s downward-firing reaction control thrusters would have put elbow room between the orbiter and the freefalling ET. The point of the PPD was to maximize the shuttle’s odds of making a clean getaway from the jettisoned ET. What made it difficult was the precision and timing with which it had to be executed. 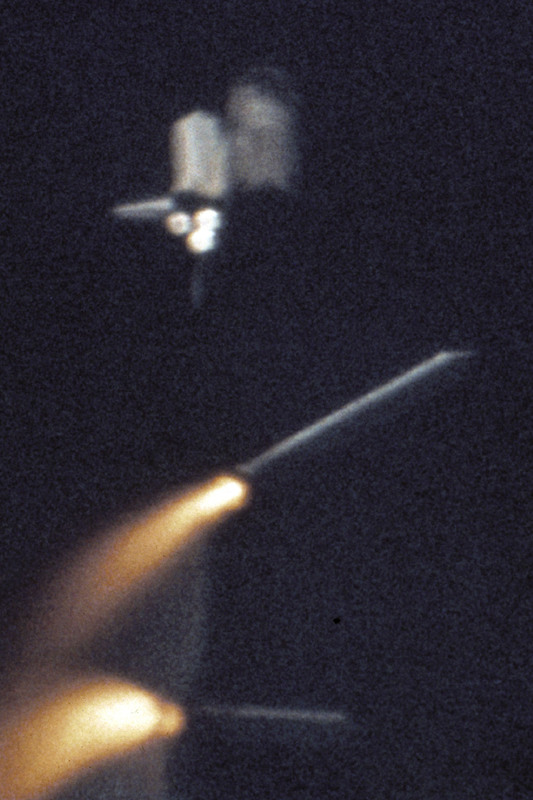 Immediately after clearing the ET, the shuttle’s nose would have to be raised to a specific positive angle. This move was necessary to position the belly-mounted heat shields to do their job through reentry. 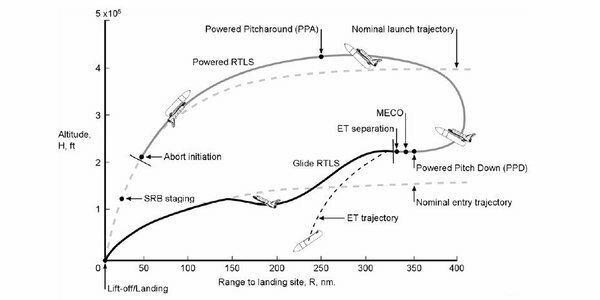 Just like the PPA, the PPD was not really a question of piloting skill (most of the maneuver could be flown by auto pilot), but whether the damage already absorbed by the shuttle would allow it to perform these precise and critical maneuvers. Arguments still wage over the sanity of the RTLS abort option. 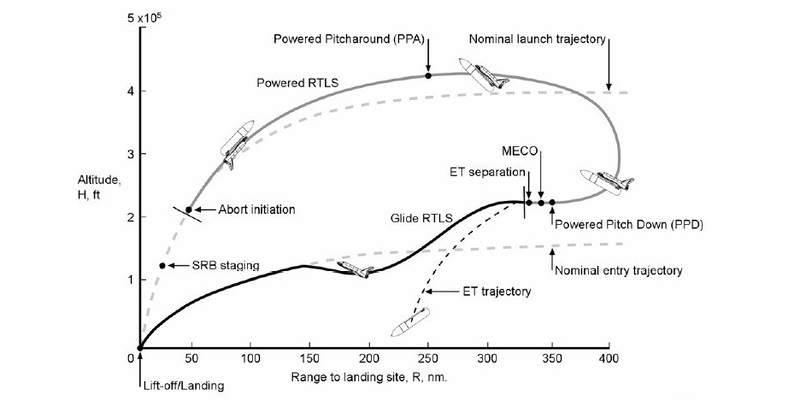 As this chart from a NASA training manual shows, RTLS required several off-nominal maneuvers. The PPA and PPD were particularly sticky. While the success rate for simulated RTLS scenarios wasn't perfect, it was good enough to provide reasonable assurance that the energy aspect of the equation could be managed by the onboard computers and savvy pilots. Despite any misgivings anyone may have had about RTLS, it was the only option when faced with a problem early in a launch. As such, the RTLS was practiced religiously by every flight crew in the Shuttle Mission Simulators (SMS) at Johnson Space Center (JSC). The same mission-specific data that was loaded onto the shuttle’s General Purpose Computers (GPCs, which provided guidance through aborts, among other things) was also loaded onto the SMS platforms. This meant that each simulated RTLS was a little different depending on the specifics of that mission, such as the payload mass, launch azimuth, specific SSME performance, etc. Presumably, the shuttle pilots and commanders knew all those energy management tricks as well. While the success rate for simulated RTLS scenarios was not perfect, it was good enough to provide reasonable assurance that the energy aspect of the equation could be managed by the GPCs and savvy pilots. The only lingering question is whether the SMS adequately factored in all of the risks associated with a real RTLS. STS-1 commander John Young found more comfort in walking on the moon than he did the thought of executing an RTLS abort. Mr. Young’s opinion certainly carried much weight. We’re not talking about some risk-averse, desk jockey statistician. This is a man who made peace with the risks of travelling to, and walking on the moon. Yet, he found RTLS a bit too much for his taste. It’s a little like Spinal Tap telling you to turn your music down! “Turn it down” is exactly what the NASA planners did. While STS-1 was not without its difficulties, it did not include an RTLS. The debate over whether RTLS was a valid abort scenario is not likely to end anytime soon. Now matter how you label the participants (optimists and fatalists, adventurists and pragmatists, Rosary kissers and number crunchers) it seems they all stand near the fence. This is one argument where rarely does one side have difficulty in sympathizing with the point of the other side. Whichever way a genuine RTLS would have ended, it would have been a near thing. For that reason, I think that there is one point that both sides of the RTLS debate will always agree on: we are better off not knowing the real answer. Terry Dunn worked for 15 years as a NASA contractor at NASA Johnson Space Center, and now lives in Lubbock, Texas, where he works as an engineer in the plastics industry.